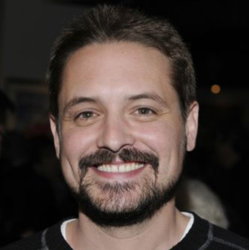 Will Friedle is an actor best known for his comedic roles, most notably as underachieving elder brother Eric Matthews on the long-running TV sitcom Boy Meets World from 1993 to 2000. As the show was drawing to a close Will segued into voice acting, which has given him an opportunity to slip in and out of numerous superhero roles, including the now iconic role of Terry McGinnis/Batman in Batman Beyond. Will can also be heard as Blue Beetle (Jaime Reyes) in Batman: The Brave and the Bold, Nightwing in Batman Unlimited: Animal Instincts and Batman Unlimited: Monster Mayhem; and Deadpool in Ultimate Spider-Man. To a generation of Disney fans, however, he'll always be the beloved Ron Stoppable, sidekick to the brave Kim Possible. Will was also Lion-O in the rebooted ThunderCats animated series, Doyle in The Secret Saturdays; and Bumblebee in Transformers: Prime, Transformers Prime Beast Hunters: Predacons Rising and Transformers: Robots in Disguise. In 2015, Will made a triumphant return to the role of (now Senator) Eric Matthews in the Disney Channel series Girl Meets World. He can soon be heard as Star-Lord in Marvel's Guardian of the Galaxy animated series, which debuts this fall.